This document gives you insight on the sections and areas of the Live Score software. This is the Live Score desktop application. 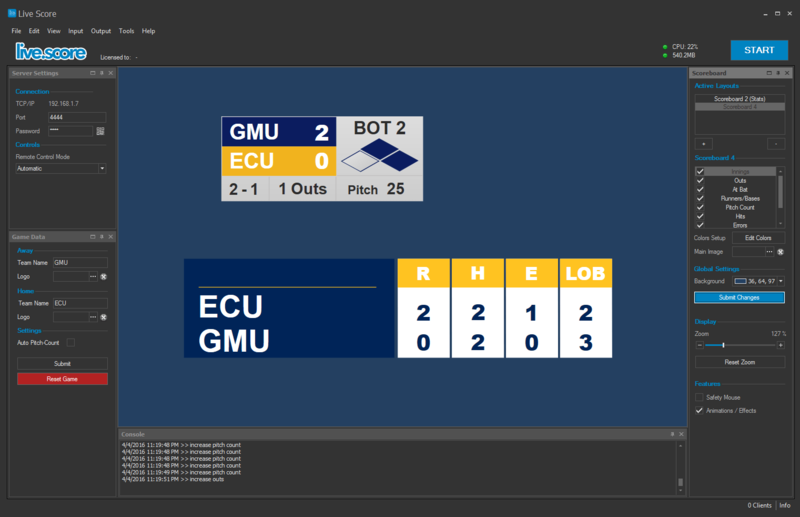 As you can see, the scoreboard is in the center of the application. There are sidebars for all kinds of properties and configuration settings. These sections are split into different features. The configuration settings are settings for your connection, game and scoreboard. These settings are all separated in sidebar panels next to your scoreboard. All these configurations are stored. So if you close your application and restart it, the will automatically be restored. The configuration settings are split into the following sections. General Settings can be found in Edit->Settings. The opening window contains everything that doesn't fit anywhere else. In the lower right corner, you can see the number of currently connected clients. If you click on this number, you can get more insight on the clients and their type, TCP/IP Address and so on. The debug console helps you to check client activities and resolve errors. Whenever a client connects or sends anything to your desktop application, you will see it there. You can maintain all your registered licenses in Help->License Details. Here you can enter new licenses, delete existing ones or simply see what you have registered.